The call went out to pilots across the galaxy: climb into your cockpit, ready your hyperdrive, and make the jump to an X-Wing™ event like no other! 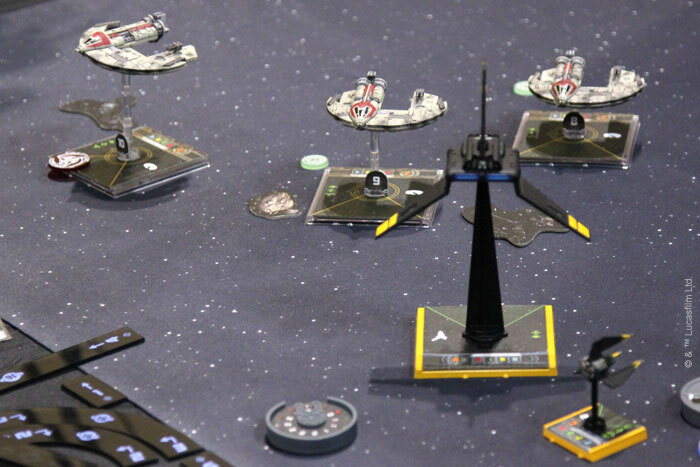 From March 31st through April 2nd, AdeptiCon played host to the first of eight events in the X-Wing System Open Series in Schaumberg, IL, USA. Travel, hotel accommodations, and entrance to the Coruscant™ Invitational at Star Wars™ Celebration 2016 in London awaited the player who claimed the title of Hoth™ Open Champion. 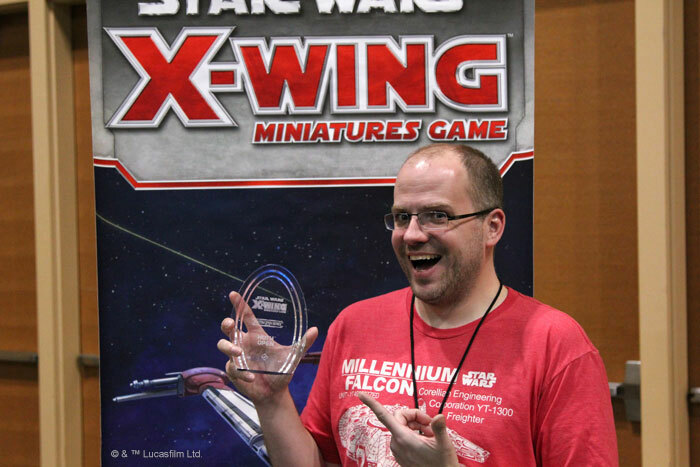 A weekend of elite competition, meeting new players, and celebrating the awesome game of X-Wing would be the consolation prize for all other entrants. Two preliminary days saw a total of 251 players enroll. Each pilot was on a mission to obtain at least 18 tournament points and advance to the final day. Six rounds of dogfights awaited every pilot. S-foils were locked in attack position, turrets and cannons unleashed barrages of laser fire, and many ships fell victim to expert maneuvers. Out of the field of hundreds, many skilled squad commanders rose to the challenge and emerged unscathed from battle. 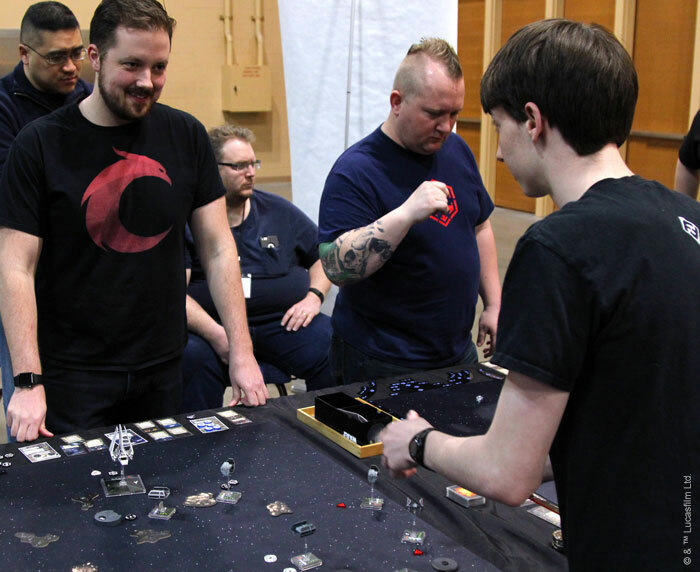 In addition to the main event, many players enrolled in the two Hangar Bay side events. In this brand-new format, each player brings two squads and reveals them to their opponent at the start of each round. Players evaluate their opponent’s squads and then secretly choose which of their own squads to fly for the round. The Rival Rule requires that the two squads each player brings must belong to different factions, ensuring some tough choices for our pilots. All pilots were Contracted Scout. The probability of successfully winning the Hoth Open was approximately 251 to 1. But don’t tell these eight players the odds. One of them was a mere three victories away from becoming the first-ever Open Champion. In the quarterfinals, four were shot down, and four remained. Eighth seed, Ryan Fleming, upset Lyle Hayhurst, who had gone undefeated through all nine Swiss rounds. Jason McMahon’s Poe Dameron Rebels were picked apart by the merciless Contracted Scouts of Darwin Schafer. Friends Dee Yun and Brad Miller faced off in a mirror match full of Captain Yorr, Whisper, and Omega Leader, with Brad emerging victorious. 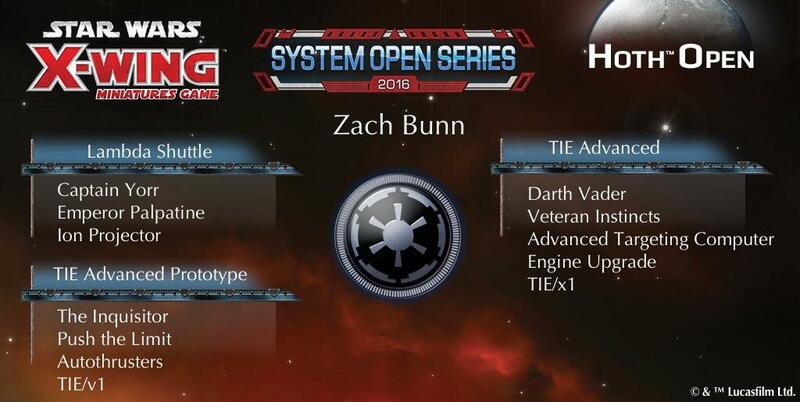 2015 World Championship 2nd place finisher, Nathan Eide, took on Zach Bunn, new to the competitive side of X-Wing, in a battle of Aces. In an excellent match filled with precise maneuvers and close calls Nathan claimed victory. The four victors were paired in the semifinals, each attempting to acquire a target lock on the Finals. Ryan showed no fear in facing down 17-year old wunderkind Nathan and started the match by immediately flying aggressively toward Nathan’s Imperial squad. The quick attack was no mere bluff, with Ryan blocking The Inquisitor and then unloading torpedoes into the fragile ship early in the match. A few turns later, he repeated the process on Darth Vader. Nathan fought back flying Soontir Fel brilliantly, but his dice refused to behave. One final Soontir Fel attack revealed 0 hits before Ryan swooped in to claim victory. Darwin and Brad faced off on the other table, both struggling for control over the match. They traded damage and ships as they jockeyed for an advantage, but it was Brad’s superb flying—sending Whisper into extremely tight quarters multiple times—that made the difference. After destroying the second of Darwin’s three Contracted Scouts, Brad was able to finish the game thanks to an advantage in ships. And then there were two. 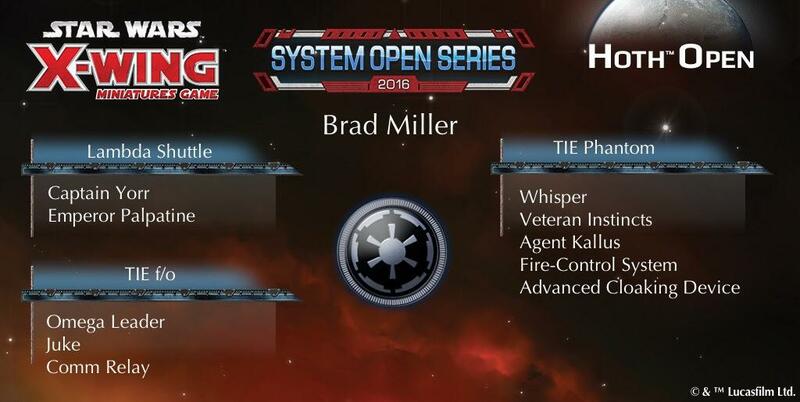 Now veterans of the Hoth Open, Brad Miller and Ryan Fleming had each flown their way to this game with monumental stakes. One player would become the Champion and representative for the Hoth Open at the Coruscant Invitational. The other would have to face devastating defeat. 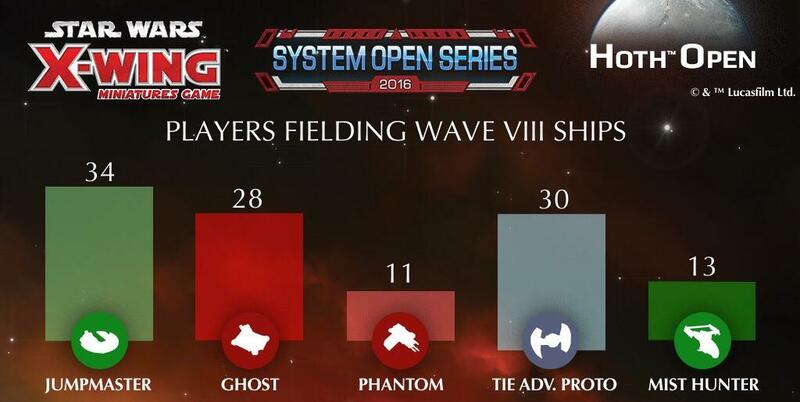 The final game of the Hoth Open was a display of strategy and skill from both players. Brad began with a strategy that served him well throughout the weekend, stalling in one of his starting corners, while Ryan crashed through the middle of board with his three Contracted Scouts. Before meeting Brad’s squad, Ryan turned his Contracted Scout carrying Boba Fett away, choosing to engage with only two of his ships. This would prove crucial to a game-altering play a few turns later. Meanwhile, Brad launched the opening salvo of laser fire, using Emperor Palpatine to force through a critical hit on one of Ryan’s ships. Ryan concentrated his return fire on Whisper, injuring the powerful TIE Phantom with an early plasma torpedo thanks to a poor defense roll and Brad’s inability to use Emperor Palpatine on defense. Soon after, Ryan flew his third Contracted Scout into the fray, launching a devastating proton torpedo at Brad’s Captain Yorr. The torpedo picked off the shuttle’s remaining shields and landed an important critical hit, allowing Boba Fett to remove Emperor Palpatine from the battle! The loss of Emperor Palpatine was a huge blow to Brad’s squad, but he had not been sitting quietly under Ryan’s withering fire. Brad responded by blowing up one of the other Contracted Scouts and pounded away at another, leaving only a few hull points. In what would become the deciding turn of the match, Brad sent Whisper on a speed-4 Koiogran turn to bring the lethal pilot back into battle quickly. Ryan anticipated the maneuver and sent his low-pilot skill ships to block Whisper’s move. Not only was Whisper unable to turn back into battle, but Brad lost his shot and action, preventing Whisper from cloaking for the turn! Ryan wasted no time in reducing the TIE Phantom to debris. 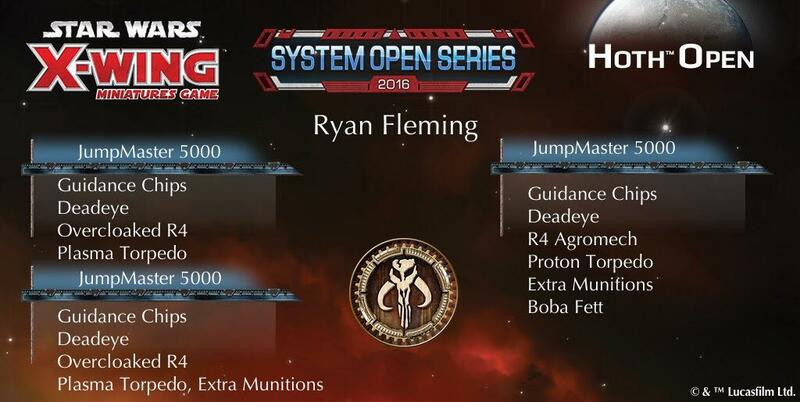 Ryan Fleming had won and claimed the title of Hoth Open Champion! We asked Ryan about how he had taken the steps in order to achieve victory at the event. 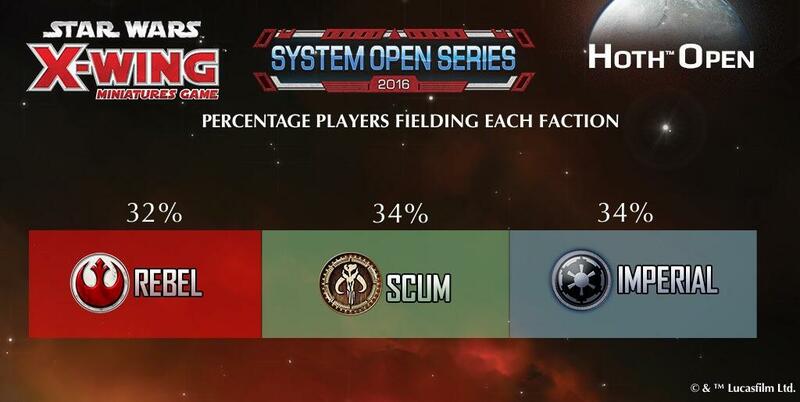 Why did you choose the squad you played at the Hoth Open? What match-up did you fear most coming into the event? What was your most memorable match during the rounds before single-elimination? 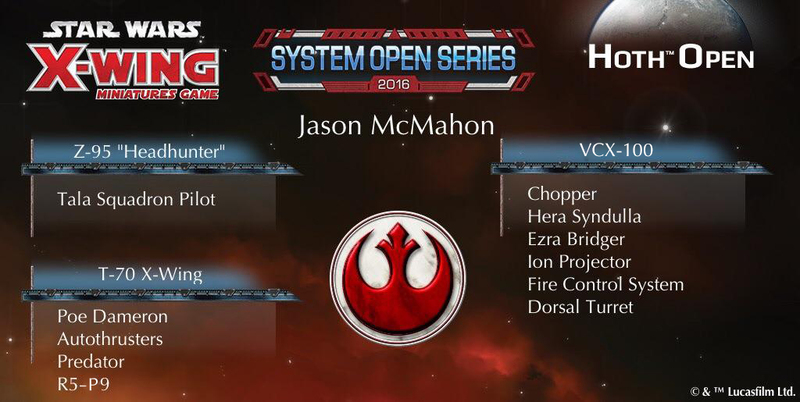 What ships are you hoping will win for each faction’s online voting, because you will have to fly them at the Coruscant Invitational? Any advice for aspiring players who will want to fly your squad at their local events and maybe win some prizes from the X-Wing Spring 2016 Tournament Kit? We will see how Ryan fares in July at the Coruscant Invitational during Star Wars Celebration 2016. The next competitors to join that field of eight will be determined at the Jakku™ Open in France and Endor™ Open in Poland beginning April 30th. 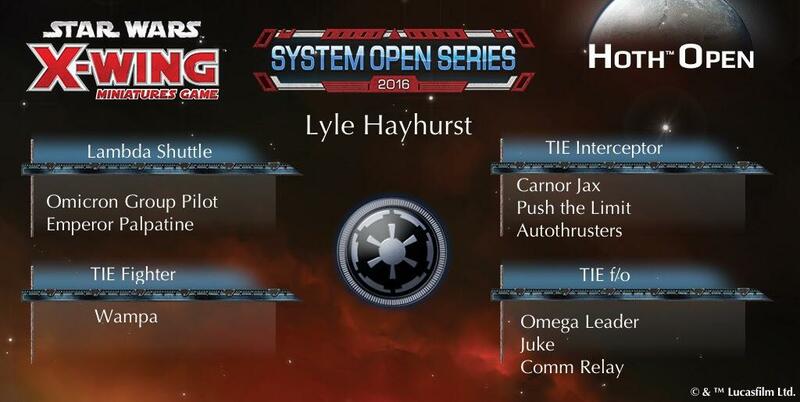 If you are unable to attend a System Open, you can still have a voice in the Coruscant Invitational! Vote to select the ship from each faction that those eight elite players will have to incorporate into their faction squads. Each round of voting also gives you the opportunity to be chosen to receive an exclusive X-Wing System Open Series prize! 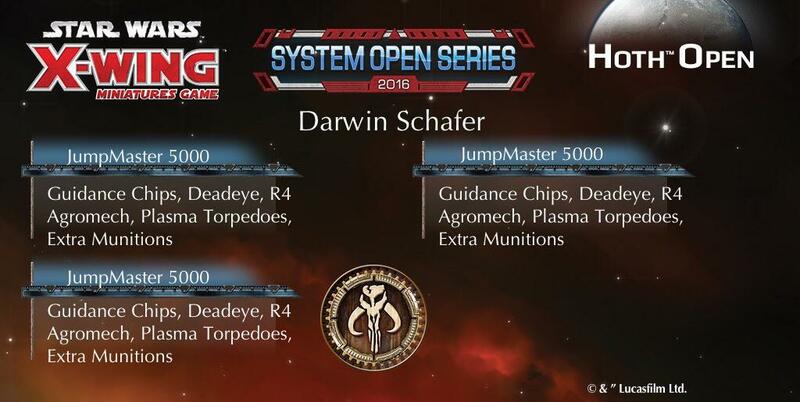 Keep your eyes on the X-Wing System Open Series site, as we’ll continue posting updates on each System Open as they happen and the Coruscant Invitational draws closer.